February 6th, 2012: The New York Giants are on the war-torn field of Lucas Oil Stadium. Eli Manning, Tom Coughlin, Victor Cruz, Ahmad Bradshaw, Hakeem Nicks, and Jason Pierre-Paul were just some of the members of the New York Giants celebrating their latest Super Bowl triumph. Not only was this the Giants' second Super Bowl title in the last 5 seasons, but it was their second consecutive time defeating arguably the greatest dynasty in the history of professional football, the New England Patriots. At this point in time, the Giants were looking at several consecutive years of stability and competitiveness. Flash forward seven years and this Giants franchise looks almost unrecognizable from a decade ago. At the current moment, the Giants have no replacement lined up for an aging Eli Manning, a General Manager who seems to almost scorn advance analytics altogether, as well as a 25-year-old All-Pro caliber safety who has no interest in continuing his signing a franchise tag with the Giants and will be an unrestricted free agent this offseason. Add to this a locker room that seems to overall have no accountability, stability, or leadership whatsoever. What has happened to, what was for as long as I can remember in my own life, one of the most successful and competitive franchises in football? The issues for the New York Giants start at the top with their GM Dave Gettleman. Gettleman was hired by the Giants on December 28th, 2017, after sitting out the duration of the 2017 season following his firing from the Carolina Panthers as their General Manager back in July after 4 seasons. One might be inclined to think that it might be a red flag that a General Manager just one season removed from making the Super Bowl (which the Panthers did in the 2015 season, losing to the Denver Broncos at Super Bowl 50 in Santa Clara, California) was fired. Another red flag might be that same General Manager only lasted 4 seasons before being shown the door. One might wonder what the reason could be for a man, one year removed from being named Sporting News NFL Executive of the Year and one year removed from a Super Bowl appearance to be fired? Despite these major red flags, the Giants decided that Gettleman was the right man for their job. In Gettleman’s first two seasons on the job, the Giants, who made the playoffs the season before he was hired, have posted back-to-back losing seasons of 3-13 and most recently in 2018, 5-11. Rebuilding is not necessarily a bad thing though. While they do not play football, the Houston Astros of the MLB rebuilt for nearly a decade and are now perennial World Series contenders year after year. However, the only thing worse than losing is bad drafting and losing. Heading into the 2018 NFL Draft, despite having the 2nd overall pick and a thirty-seven-year-old quarterback, the Giants opted to draft Penn State running back Saquon Barkley. I am not going to argue whether or not Barkley is a very good player because he is. Winning the NFL Offensive Rookie of the Year award last season is enough proof of that. However, last year’s draft saw 4 quarterbacks taken in the first round, including 3 in the top 10 selections. Baker Mayfield, the 1st overall pick by the Cleveland Browns and Sam Darnold, the 3rd overall pick by the New York Jets showed signs and moments last year that they will be franchise quarterbacks for their teams for the next decade plus. The Giants meanwhile are rolling out a now 38-year-old Eli Manning as their starting quarterback with no replacement in sight. Who was the last team with an elite-level running back that has won the Super Bowl? The Seattle Seahawks in 2014 might be the most recent example but even their elite running back at the time, Marshawn Lynch, only had fifteen rushes for thirty-nine yards in their utter beatdown of the Denver Broncos. The point being, a Superstar running back does not win you Super Bowls in the modern era of the National Football League. Of the last 5 Super Bowl winners, the New England Patriots have won three times and both the Philadelphia Eagles and Denver Broncos have each won once. Did all those teams have a good running back play? Yes. Was it necessarily elite? I do not know. While they're good at what they do, would you really call CJ Anderson and James White elite running backs in football? The other major issue that the Giants face is that their locker room seems to have zero stability and zero leadership. Odell Beckham Jr., the current face of the New York Giants franchise, seems to still struggle to find his maturity. From proposing to kicking nets on the sideline to posing for pictures in Miami, Florida on a boat the week before a playoff game are just some of the examples of a player who isn't ready yet to inspire his team. Are we supposed to be shocked when a player of the quality of Landon Collins refuses to sign a franchise tag with the Giants? Obviously, the Giants still have time to right this ship. With the 6th overall pick in this year’s draft, the Giants have yet another opportunity to right their ship and secure a franchise quarterback potentially with prospects like Kyler Murray, Dwayne Haskins Jr., and Daniel Jones all being available. However, unlike last year when the Giants passed on what looked like then and still looks like now a sure thing in Sam Darnold, all three of those quarterbacks have major question marks about their potential to become franchise quarterbacks at the next level. There is also no guarantee that Murray and Haskins Jr., the runaway top 2 quarterback prospects in this draft, will even be there at the 6th pick. 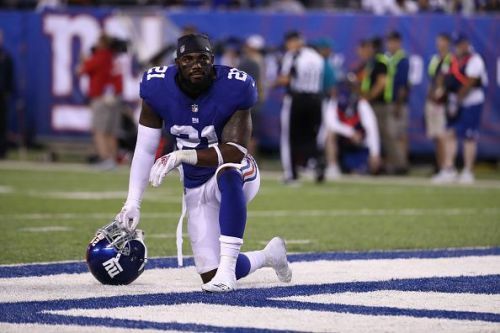 At the moment, the Landon Collins news is just the latest example of the lack of stability and direction that the New York Giants continue to face.